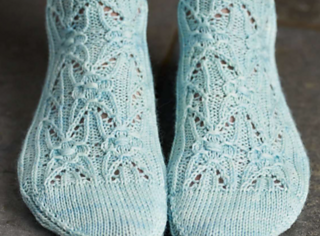 FLOWERY MOTIFS are the stars of the show on these fresh and pretty socks by Amanda Jones. The flowers are formed by working wrapped stitches on a background of reverse stocking stitch, lace and twisted stitches. The socks are knitted from the top down, and the stitch pattern is both written out and charted for you. To fit foot circumference 23-25cm (9-9.75 inches). Actual circumference 20cm (7.75 inches).